This tier list will show you how good your Water Element 5 star characters are when it comes to burst damages and ranking events. Refer here if you are looking for specific or elemental characters that you can use for your team. For best results, use vs their counter element and with teams. For beginners with limited number of characters, aim for a high ranked Dagger, Lance, Rapier, Dual, or Sword wielder that can also generate combos. - SS3s are easy to spam, just time it well, best with combinations. 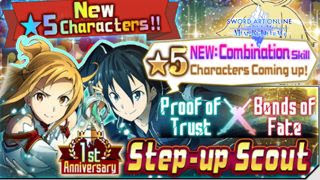 - Combo Partner: [Asuna] - Increases damage attained by 10%. - SS3s are easy to spam just time it well. - Combo Partner: [Kirito] - Increases damage by 10%. - SS3s are easy to spam. - Combo Partner: [Alice] - Increases damage attained by 10%. - Characters with average or low Hits/Sec on their SS3s, or using long ranged or slow speed weapons. Still strong characters especially against their counter elements, best played with combo generators to deal stronger nukes at higher combo counts. - SS3s are easy to spam, turn off Auto-Approach to increase range. - Combo Partner: [Water Element] - Increases damage by 10%. - SS3s are easy to spam, just time it well. - #.#sec* = Average Time. Dual Wielders (and some units) will get Max/Min speed depending on combos (10~50) but will only consider their average speed and DPS.